Last summer, Brooklyn design studio Pensa decided to test out a public solar-powered charging station for mobile devices in the studio's home borough. The idea immediately took off and what started as a trial project in Dumbo, Brooklyn's Pearl Street Triangle in 2012 has become a citywide effort in 2013. On Tuesday, Solar power technology firm Goal Zero, Pensa, and AT&T unveiled the first of many solar-powered charging stations that will keep New Yorkers powered up this summer between work and a night out on the town. Dubbed Street Charge, the first station is set-up at Fort Greene Park, Brooklyn with plans to expand the stations to popular locations across the five boroughs such as Brooklyn Bridge Park, Coney Island, Governor's Island, Union Square, and Summerstage in Central Park. Each station features six USB outlets including connectors for iPhones (30-pin and lightning), as well as micro USB connectors for Android, BlackBerry, and Windows Phone. There are also regular USB ports for anyone who brings their own cable. The station takes about an hour to fully charge a phone, but is meant for quick power-ups that keep your phone running. Goal Zero says the charging stations, powered by the company's solar panels and lithium batteries, could also be used to add Wi-Fi access points, lighting, waypoint signs, and advertising. Street Charge is set to be a summertime-only affair for New Yorkers. But the idea of solar-powered charging stations is something that could be a boon to the sunnier parts of the United States and other parts of the world. Nearly 139 million Americans owned a smartphone as of April, according to the latest numbers from market research firm comScore. 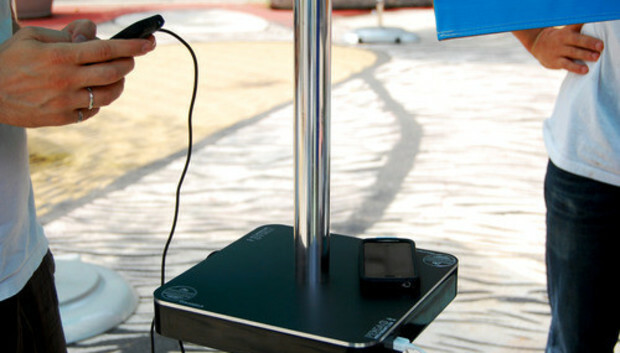 To feed those device's electricity needs, conventional charging stations are popping up in all sorts of public spots including airports, shopping centers, and even bus stops. AT&T says it may roll out Street Charge stations to other cities across the U.S. in the coming years, keeping people charged up with an eco-friendly solution, according to The New York Times. Even though smartphones and tablets don't rack up your electricity bill that much-- energy efficiency firm Opower recently estimated you can keep your iPhone 5 charged all year for less than fifty cents--solar-powered personal chargers are becoming more readily available. For about $120 you can buy a small, portable solar panel to stay at home and a small charging cell to take with you that can recharge your smartphone in about an hour. You can also use the portable solar panel to charge your devices on camping trips, hikes, and other off-road adventures. Smartphone cases that use solar power to charge your smartphone have been around for a few years. And earlier this year, a company called Ubiquitous Energy debuted an early prototype of a photovoltaic film that could one day power your device by absorbing ambient light as you go about your day. Charging your devices at home may not break the bank, but in this age where we carry multiple electronic devices around with us every day, even small choices to go green can make a big impact.